These skills are evident when we look at three additional batting metrics; outside the zone swing percentage, inside the zone contact percentage and walk/strikeout ratio. 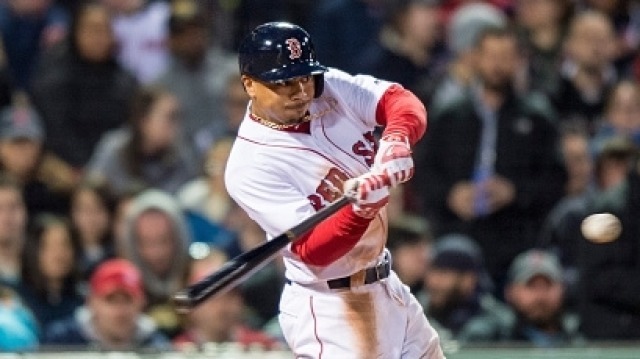 In 2018, Betts only swung at 1 out of 5 pitches outside the strike zone (4th best in MLB) while he made contact with pitches in the strike zone 93% of the time he swung at them. This combination resulted in a walks to strikeout ratio of 0.89, which was 11th best in all of MLB. But why? Why are some players able to process the visual stimuli of an approaching ball so much better than others? Why are some able to swing a round bat at a round object and make contact more often? Recently, two teams of researchers tried to discover a link between superior perceptual-cognitive ability and hitting performance. If found, this connection may offer an opportunity to identify the superstars of tomorrow based on their raw hand-eye coordination. The Visual Clarity task measures visual acuity for fine details at a distance. The Contrast Sensitivity task measures the minimum resolvable difference in contrast at a distance. The Depth Perception task measures how quickly and accurately participants are able to detect differences in depth at a distance using liquid crystal glasses. The Near-Far Quickness task measures the number of near and far targets that can be correctly reported in 30 seconds. The Target Capture task measures the speed at which participants can shift attention and recognize peripheral targets. The Perception Span task measures the ability to remember and recreate visual patterns. The Eye Hand Coordination task measures the speed at which participants can make visually-guided hand responses to rapidly changing targets. The Go/No-Go task measures the ability to execute and inhibit visually guided hand responses in the presence of “go” and “no-go” stimuli. The Reaction Time task measures how quickly participants react and respond to a simple visual stimulus. Next, the research team compared these results to the players’ batting statistics (on-base percentage (OBP), walk rate (BB%), strikeout rate (K%), and slugging-percentage (SLG) ) for the following season looking for statistically significant correlations. By far, the Perception Span task had the highest predictive power to better batting performance, especially in OBP and K% but also in BB% and SLG. This test presents a circular pattern of multiple dots, some turned on, some turned off. The user is shown the pattern, then asked to recreate the pattern on a blank slate. In addition, BB% was also correlated with test results for Depth Perception, Eye-Hand Coordination and Reaction Time. Not too surprisingly, eye-hand coordination was also found to be a predictor of hitting success in another study by Dr. Daniel Laby of the Sports and Performance Vision Center, State University of New York College of Optometry. He and his team tested 450 professional baseball players during a spring training season using the eye-hand visual motor reaction time [EH-VMRT] test. They compared the results with specific measures of plate discipline, including walk rate and how often players swung at pitches in the strike zone. Those players with the best hand-eye coordination also had better walk rates, getting a base on balls every 10 times at bat versus every 13 times for players with slower hand-eye performance. In addition, those in the top 20% of the EH-VMRT were 6-7% more likely to swing at pitches in the strike zone, especially fastballs (versus off-speed pitches). "One could hypothesize that faster EH-VMRT allows the batter an opportunity to be selective in which pitches he ultimately decides to swing at," wrote Dr. Laby and his team. "These timing differences may result in higher rates of swinging at pitches and a lower likelihood to gain a base on balls." As teammates on the champion Red Sox, J.D. Martinez, no slouch of a hitter either, recognizes the decision making skill of Betts. "That's what he does," Martinez said. "He makes good contact, makes solid contact, and I think his mind is in the right place now where he's kind of lining up and kind of understanding the swing and the mechanics behind it to be able to drive the ball that way better." Martinez should know, he shows his plate discipline by leading the league in another advanced hitting stat, BABIP (Batting Average on Balls in Play), which is the rate at which the batter gets a hit when he puts the ball in play.